A century ago the poet and polymath Rabindranath Tagore (1861-1941) carried out experiments in rural reconstruction and lectured around the world to warn against nationalism and ‘the greed of profit’, and to advocate creative unity. He gives us an inspiring example of the environmentalist principle of ‘think globally, act locally’. Tagore would have been appalled at the devastation brought about since his lifetime through accelerating exploitation of people and planet, and his response would surely have been to act locally in an even more radical way. For ten years I have studied and written about the relevance of Tagore’s words and deeds to the present world in crisis. In a paper entitled ‘Tagorean Veganism’, I argued that Tagorean radicalism would mean establishing diverse plots of largely perennial plant foods, as locally as possible, in each individual village or neighbourhood or home garden. In another paper I looked at the beneficial reduction effect of radical relocalisation, in that it makes the bulk transport of food stuffs unnecessary, thus removing the need for single use packaging and saving the energy expended, not just for powering vehicles, but also on building infrastructure to facilitate transportation. In this paper I look at another beneficial reduction effect of Tagorean radicalism, in that it means that entertainment and leisure pursuits would be created and enjoyed in our local communities, rather than remotely via the internet. One of the most energy demanding communication media known as ‘streaming’ could be phased out, thus saving the energy expended on the global online infrastructure, and to build, run and cool the expanding and multiplying banks of computers in data centres, energy which is largely generated by burning fossil fuels. Optimists point out that some data centres are being located in cold locations and might be powered by alternative energy, but the strong trend towards streaming and away from physical media renders makes such a solution doubtful, since wind turbines and solar panels require fossil fuel energy to build, and tackling climate change requires major reductions in demand for energy. In the music of the rushing stream sounds the joyful assurance, “I shall become the sea.” It is not a vain assumption; it is true humility, for it is the truth. The river has no other alternative. On both sides of its banks it has numerous fields and forests, villages and towns; it can serve them in various ways, cleanse them and feed them, carry their produce from place to place. But it can have only partial relations with these, and however long it may linger among them it remains separate; it never can become a town or a forest. But it can and does become the sea. The lesser moving water has its affinity with the great motionless water of the ocean. It moves through the thousand objects on its onward course, and its motion finds its finality when it reaches the sea. Tagore is using the stream as a metaphor for the soul flowing towards Brahma, which is particularly apt when we consider the meteorological cycle by which the sea is the source of all the streams. In contrast, modern digital streaming involves a one way flow due to the electricity powering it coming from the burning of non-renewable fossil fuels, and consequent emission and build-up of the greenhouse gas carbon dioxide into the atmosphere. The electricity powers and cools vast banks of computers in datacentres around the world, their transient function being to drive the assembly, coding and compression, and dissemination of instantaneous images and sounds. We have seen this great stream of civilization choking itself from debris carried by its innumerable channels. We have seen that with all its vaunted love of humanity it has proved itself the greatest menace to Man, far worse than the sudden outbursts of nomadic barbarism from which men suffered in the early ages of history. We have seen that, in spite of its boasted love of freedom, it has produced worse forms of slavery than ever were current in earlier societies, slavery whose chains are unbreakable, either because they are unseen, or because they assume the names and appearance of freedom. We have seen, under the spell of its gigantic sordidness, man losing faith in all the heroic ideals of life which have made him great. Therefore you cannot with a light heart accept the modern civilization with all its tendencies, methods and structures, and dream that they are inevitable. You must apply your Eastern mind, your spiritual strength, your love of simplicity, your recognition of social obligation, in order to cut out a new path for this great unwieldy car of progress, shrieking out its loud discords as it runs. The way Tagore expresses his concern leads us to consider if it is possible to stop the flow of modern progress, rather than try to mitigate some of its effects. His alternative as stated here was originally addressed to his audience in Japan in 1916, hence his reference to ‘your Eastern mind’, and ‘new path’ which is actually a return to Buddhist social traditions and away from emulating the West. 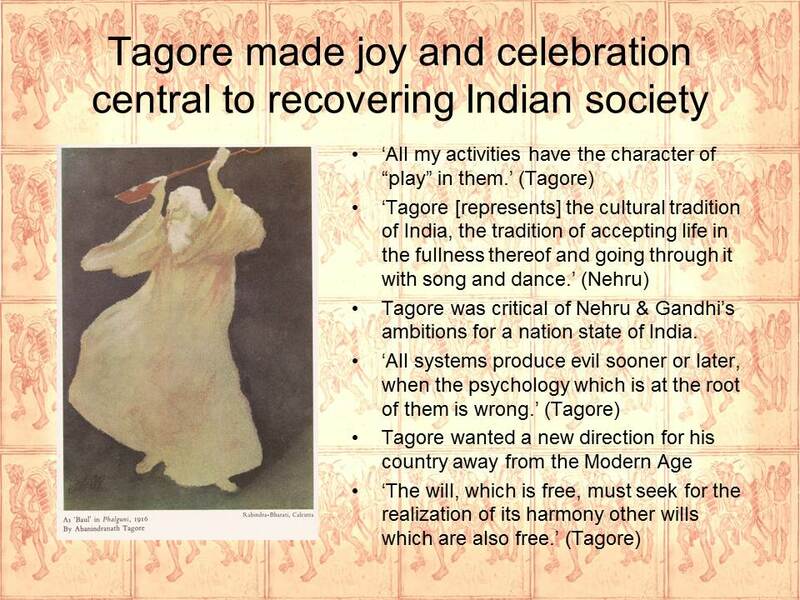 In India, as we know, Tagore endeavoured for much of his life to revive traditional village society, and he saw song, dance and theatre as crucial for what he called ‘life in its completeness’ in rural communities. It is interesting to look at modern streaming with Tagore’s alternative in mind, because many people are turning to this technology to listen to music and watch films. An alternative for reducing the environmental damage from powering datacentres by electricity generated using fossil fuels would be a return to physical media, CDs and DVDs, which would seem to be an easy personal action to take. A recent discussion I initiated on Facebook brought up doubts about whether this is possible or fair. The background to this discussion was my deciding not to go along to a talk about the radical protest group Extinction Rebellion in Cornwall because the focus of the talk was local action in Cornwall, and because it would mean a long and late train trip home. I also hesitated to get involved because of my doubts about whether politics and protest can save the planet as both have very discouraging records. My own view, very much reinforced by Tagorean thought, is that it is more important to make changes in one’s personal life and in the local community, because such changes are real and immediate. I am encouraged in such a view from knowing about the fast-growing local foods movements around the world, which are bringing about a strong trend towards localization independently of government policies. At the end of my Facebook post about my decision not to go to the Cornwall meeting, I added the thought that one thing that needs to change is awareness of the carbon cost of streaming, hence the need to go back to physical media. This final point gave rise to adamant objections from a young friend I will call Amy, who is American but now lives and works in South Korea. I am ending this blog post with that exchange in full, largely unedited, and discuss it in my next post on ‘Tagore and Streaming’. I don’t think it’s possible to get people to stop streaming. Here in South Korea they literally don’t sell DVDs unless it’s a special edition $200 box set. Most people don’t own DVD players. And south korea has one of the fastest internet (and cheapest I’d say) in the world. It’s become a way of life and connects people in ways that wouldn’t be possible otherwise. (Also I have often made YouTube videos as part of my job… and I really like my job). BUT. I think that the servers and data centers and everything honestly should all be running on renewable energy. The only reason more isn’t going into renewable energy is because the people with the most money and the most power are doing their best to block it. Or because people (Trump) are just legitimately stupid. There is a lot of power in controlling oil and natural gas, and in some places coal as well. There’s never going to be the same power in wind etc.. And so for me as an individual, what I feel I can do is try to support the companies using renewable energy and other green practices, but also campaign for and vote for people who want to make renewable energy a priority for their political careers. You say it’s up to the individual to save the planet, I argue it’s up to individuals to vote, to throw the current broken systems out on their asses, and to work together to build something better. Also I’d add, the Arab Spring was broadcast to the whole world via Twitter and streaming. And while there’s still ways to go, that was such a momentous event. If not for the internet, news of what happened probably wouldn’t of left the region, it might not have even happened. I remember following those events closely, and seeing the power of a collective group of individuals. And those people fighting could see the support they got world wide. I don’t think that connectivity (which is so much streaming along with other things) should ever be taken away, and no one should be discouraged from it. And I just want to add, you said politics have discouraging records. But politically speaking, carbon emissions haven’t been discussed for very long, only introduced in the 90s. But it’s only more recently in the past 10 years or so that it’s become a really mainstream discussion (thanks, in part, to many wonderful scientists streaming globally I think). And I do think the people running for offices currently (in America) are *very* different from the candidates we had 10 years ago. I think that makes a big difference. […] Is climate change the biggest threat? What about land degradation and species extinctions, also toxic air pollution and plastic waste everywhere? These are present problems we can see, not future threats those with vested interests continue to deny, or claim technology will fix, and if we addressed these present problems we’d avert climate change anyway. It’s a generation thing. I learned about destruction of forests, pollution of seas and atmosphere from my father when I was a girl in the 1950s. Active in environmental groups in 1970s and 80s I was dismayed at switch from all those present problems to warnings about ‘The Greenhouse Effect’. Just because climate change is affecting people now doesn’t change how opportunities were lost 40+ years ago to address land degradation etc. with local alternatives, less mechanisation, fossil fuels etc. I feel it is still the case that we need to focus on land degradation etc. to avert climate change – local food especially, food forests. I still believe we have to stop streaming and the cloud as those data centres are enormous and growing and they’ll never be powered by renewables. Relocalisation may seem drastic, with the loss of the nice things you mention, but that has all gone too far already. How much does the planet matter? may seem a silly question but we have to ask it. Why would they never be powered? Are you saying that it’s physically impossible for the world to be powered? How can you be sure? That’s not what your degree is in!!!!! YOU don’t have the technical knowledge to be able to guarantee that either way. But I also know that besides all of the lovely things I mentioned, like… the *Arab Spring*, I didn’t mention the access to high quality and low cost or even free education that has been made available because of data. I have a personal friend from the Congo who was able to get a masters in engineering from a US university because of the internet. Without it, he wouldn’t be working to improve infrastructure and green powered public transportation, which he is doing now in South Korea. The more information and education we can spread, the more minds we can have working towards our planet. Also I was talking about discussion of carbon emissions in the US congress, which is what I know. And the first bill was proposed in the US congress in 1990. I did NOT say that it wasn’t discussed in other circles. I was talking about wide spread public discussion through legislation. You can’t expect an average person to be aware of something that isn’t being discussed in legislation by their local governments. And in terms of localization, I live in South Korea, which is a similar size to the United Kingdom and has a similar population. South Korean’s staple food is rice. It is a fact that there is not enough arable land to feed rice to all of the South Korean population. Should my people starve because of localization? Which people? Who should decide which? Who should decide why? And don’t tell me that everyone can grow their own food. RICE is the staple food of my people. And rice requires a specific land to grow. I’m not willing to tell my people to give up their culture and heritage. I’m not going to tell them to starve. I’m not God. I WILL have faith in spreading information, and education, and in the capacity human mind. Only by living life fully can you outgrow it. When the fruit has served its full term, drawing its juice from the branch as it dances with the wind and matures in the sun, then it feels in its core the call of the beyond and becomes ready for its career of a wider life. But the wisdom of living is in that which gives you the power to give it up. For death is the gate of immortality. Therefore it is said, Do your work, but let not your work cling to you. For the work expresses your life so long as it flows with it, but when it clings, then it impedes, and shows, not the life, but itself. Then like the sands carried by the stream it chokes the soul-current. Activity of limbs is in the nature of physical life ; but when limbs move in convulsion, then the movements are not in harmony with life, but become a disease, like works that cling to a man and kill his soul. Rabindranath Tagore, ‘An Eastern University’, in Creative Unity (London: Macmillan, 1922), pp. 167-203 (p. 201). Marsh, ‘Tagore and the Gunny Bags: making connections between the ruinous effect of plastic in our world and gunny-bag factories in Tagore’s day’, in Tagore At Last. Tagore, ‘The Realisation of the Infinite’, in Sadhana: The Realisation of Life (London: Macmillan, 1913), pp. 145-64 (p. 156). Streaming is explained as follows in Wikipedia: ‘Streaming media is multimedia that is constantly received by and presented to an end-user while being delivered by a provider. The verb “to stream” refers to the process of delivering or obtaining media in this manner; the term refers to the delivery method of the medium, rather than the medium itself, and is an alternative to file downloading, a process in which the end-user obtains the entire file for the content before watching or listening to it. ‘A client end-user can use their media player to start playing the digital video content or listens to digital audio content before the entire file has been transmitted. Distinguishing delivery method from the media distributed applies specifically to telecommunications networks, as most of the delivery systems are either inherently streaming (e.g. radio, television, streaming apps) or inherently non-streaming (e.g. books, video cassettes, audio CDs). For example, in the 1930s, elevator music was among the earliest popularly available streaming media; nowadays Internet television is a common form of streamed media. The term “streaming media” can apply to media other than video and audio such as live closed captioning, ticker tape, and real-time text, which are all considered “streaming text”. ‘Live streaming is the delivery of Internet content in real-time, as events happen, much as live television broadcasts its contents over the airwaves via a television signal. Live internet streaming requires a form of source media (e.g. a video camera, an audio interface, screen capture software), an encoder to digitize the content, a media publisher, and a content delivery network to distribute and deliver the content. Live streaming does not need to be recorded at the origination point, although it frequently is. ‘There are challenges with streaming content on the Internet. If the user does not have enough bandwidth in their Internet connection, they may experience stops, lags or slow buffering in the content and some users may not be able to stream certain content due to not having compatible computer or software systems. Tim Berners-Lee, ‘One Small Step For the Web’, https://www.inrupt.com/blog/one-small-step-for-the-web. Tagore, ‘‘Nationalism in Japan’, in Nationalism (London: Macmillan, 2016), pp. 47-93 (pp. 56-7). ‘We are facing an unprecedented global emergency. The government has failed to protect us. To survive, it’s going to take everything we’ve got. Lester Brown, World on the Edge: How to Prevent Environmental and Economic Collapse (London: Earthscan, 2011) pp. 175-78. Tagore, ‘The World of Personality’, in Personality (London: Macmillan, 2016), pp. 41-74 (pp. 64-5).